In many schematics, we have two capacitors connected in parallel to a crystal? Why do we have capacitors parallel to crystal? Whats the purpose? How are the capacitor values determined ? The oscillator is called a Pierce Oscillator. So you want to pick C1 (usually = C2) such that CL is close to the number on the crystal datasheet. In general, it's not that fussy usually and you can use a few pF (like 5pF) for the values of Ci and Co and Cs. Because the crystal itself is a very high "Q" resonator, slight mismatches in the capacitance won't have much effect. If you're trying to keep time-of-day, you may wish to be more fussy and/or adjust the load capacitance, but usually 100ppm either way doesn't make so much difference. There are enough variables that you may wish to use whatever the recommended crystals are from the chip maker. In general there no guarantee that your oscillator will oscillate otherwise, since chip makers very seldom specify parameters such as transconductance (gm) limits over temperature that could be used to guarantee operation. There is thus ample opportunity for the chip maker to blame you and the crystal maker, and the crystal maker to blame you and the chip maker (the uncomfortable common factor being you). Such capacitor topology is used to fine tune the crystals resonate frequency closer to what is on the label. The manufacture of the crystal makes them so they run a very tiny bit fast until you install the capacitors of the specified values. They will then run closer to the 'ideal' specified frequency. Also these need to be good quality low drift X7R or no drift NPO types. Note that extreme changes in ambient temperature will cause the crystal to drift off the ideal frequency. 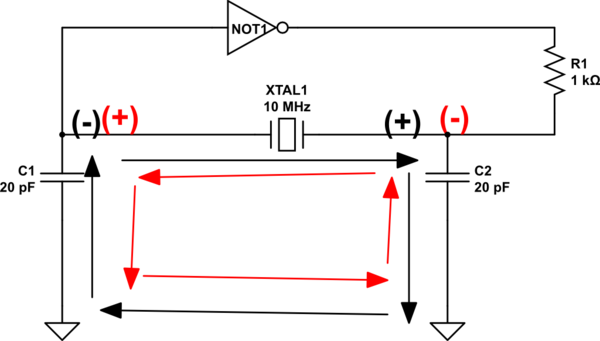 If very tight accuracy over time is required then crystal oscillators are mandatory. For extreme long-term accuracy TCXO (Oven controlled oscillators) are required. Not the answer you're looking for? Browse other questions tagged crystal or ask your own question. How to design the capacitors used with Crystal Oscillators? Why use capacitors with crystals? Can I use a series crystal in an parallel crystal optimized oscillator?